Knitting help - Have A Question? Please submit your question below. Knitting Help - What Is Your Question? Knitting Help page allows visitors to submit questions related to knitting. You can ask me anything about knitting and I'll try to answer them as best as I can. I'm a good knitter but not the greatest. If I can't find the answer you're looking for, I will share it with my knitting group. Perhaps, someone else might be able to answer them. Write your Knitting help question in a form below. If you wanted to be notified when your submission is published, you must to fill in your email address. No one will be able to see your email and I don't correct your email. The automatic notification will send you an email to let you know where your content page located. I answer all of the questions that sent in. If you prefer not to give an email, you can look for your content in this page or at the Knitting Blog. I would appreciated if you drop me a line or two to let me know whether or not my question is helpful to you. Thank you for those who responded to me. It's good to know that you saw your posts and solves your knitting problem. Need Help With Knitting? Post Your Question or Add Comment Here. Have a question about knitting or comment regarding this website? Share Your Questions and Thought Here. You'll be asked to enter your email address if you wanted to be notified when your contribution is published. I understand that you will display my submission on your website and/or your knitting Facebook page. What Knitting Questions Other Visitors Have Asked Or Commented About This Site. Can’t decipher this part of pattern, help please. I knitted my granddaughter a baby blanket and I want to knit one just like it for a doll. How do I decrease the blanket to about half the size? how do I connect a waist band to the dog sweater? where do i start my tension gauge? How to decrease every row 0 times? How can an odd numbered row be right side? I am knitting a dog sweater and have to come to s11 k1 psso. I am confused about the s11. Can you enlighten me? How do I get the right gauge? Are selvage stitches included in the total numbers for a cast on? 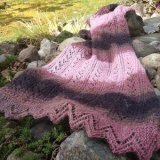 How do I follow this Leaf square Blanket pattern? Does cabling necessarily increase the stitches needed? How do I " m1 knitwise in leg on sts under the last sts of the 2tog"
If the pattern says yo k 5, do I do the yo before each knit stitch or only the first one? My directions read. (k1(k 2Tog yo) Twice. Do I knit one stitch between patterns yo k 2tog? Row 2 says so p1 p1 but I only have 2 st on needle. I learned and forgot how to take away the jagged line and create a straight one when I add a new color as in a striped hat. When the pattern says finishing on 2nd partt row what does this mean? How can I fix a dropped edge stitch? How do I tighten up my stitches? Is the stitch count correct? Pattern says, “with right side facing”. Does that mean face out? Or facing me? How do I wrap and turn at the end of a row? I'm not sure I am doing it right. It seems to curl where the wraps are. Somehow it doesn't look right. how do I sew together a hood ? I knitted this pattern the first time all the way through with no problems, it's just that I got old. I was asked to finish this shawl but can't find a pattern. Should I just keep decreasing until I think it is wide enough for the shoulders? I want to knit a shawl. But a very simple and easy one. I've been using number15 needles. Cable Throw by Premier - incomplete instructions? WHEN A PATTERN CALLS FOR EVEN ROWS TO PURL PURL STS, AND KNIT KNIT STITCHES, WHAT DO I DO WHEN THERE WAS YO IN PREVIOUS ROW? How do I knit this row? What does it mean "12+5" It starts with cast on 125 sts. This is for a lacy pattern. Knitting instructions say knit 4 tog tbl ( I don't know what that means). can you explain. When I knit St st the ends curl in so it looks like a tube. What do I do to correct that. Thank you for any help you can give me. How do I modify a pattern with a motif in it? My sister knits she says she has 146 stitches and now it says increase next row by 20 stitches how does she do this. How do I uncurl sides of a scarf? How do I K1,*yfwd,K1, rep from* to end..
How do I make the item longer? Question: How do I make the wrap longer? Will a cowl pattern calling for a circular needle 24 in work on the same needle size 29 inch? Question: Will a cowl pattern calling for a circular needle 24 in work on the same needle size 29 inch? Question: NEED HELP WITH A BABY PATTERN. ROW. K1, YO,P1, PURL 3,P1, YO, k1.? Decreasing Neck Opening on Circular Needle Working Both Sides at Same Time? How do you you do yfwd,yrn when it's followed by a knit stitch? How do you do k2,yfwd,yrn,k2? How do I k3 -loop. Missed Slipping The First Stitch - Is there a way to fix it without ripping it apart? I have a pattern that says decrease 5+4+3+2+1 this is at the arm edge. Never come across this before. Is it possible to change a patten from v neck to round neck on a baby cardigan? Clarification of instructions - K2, *p3, yo, what does it mean? If directions say, K2,*p3, yo, what do they want you to do? How do I read this pattern? My pattern is purl knit through back of loop, when decreasing at neck edge which stitch should I use. What is "knit 3 rows even"? Question In a sock pattern for a baby, it says to knit 24 rows in ribbing and then 3 rows even. What does this mean? Help with pattern - I am stumped! (RS) K1. (K1.P1) 4times. Sl1.K1.Psso. Pat to end of row. Work 3 rows even. Cap Hill Cable Hat - What does C5F stand for? What does T2K abbreviation mean? Question I'm working on a pattern the instructions say T2K. What does this mean? Question If instructions say (P1, K1) twice, P1, *k2, (P1, K1) twice, P1, repeat from *, what exactly should you do? The instruction says "WYF slip 3, P3, WYF slip 3". My question is do the slipped stitches get worked, or do they just remain slipped? How do I make a 34" cable Sweater to a 36" cable Sweater? I was wondering where/how I would increase the size of the Sweater. Should I use bigger needles and/or add knitted stitches? Pattern says s1,yrn, k2tog how? The Pattern says s1, yrn, k2tog how? How do I stop scarf from rolling into a tube. I'm a beginner. Can you help me understand this pattern. How Do I Do The Following? American girl doll snow princess dress. Question: I have 10 stitches on my right needle and I need to pass the first st over the other 9 sts. How do I do this? I didn't knit the starting border correctly and now have finished the whole piece. Any way I can change the border without ripping it all out? When knitting and the pattern says to dec2 does that mean to knit two stitches together twice or knit three stitches together. The M1 Stitch - Is there any easier way to do this? How do I increase the stitch? Question I am a new knitter. What does "knit, dec. (0-1)" mean in a pattern? I know the dec stands for decrease but what about the numbers? Question: I am knitting a scarf and the sides of the project are rolling in. What can I do to correct this? How do I fix a skipped lace stitch? How do I uncurl edges on an acrylic yarn knitted scarf? The scarf is knitted length wise and the edges curl up. The yarn is acrylic and therefore blocking won't help. Please advise. Thanks so much!! Do I have to add a stitch when converting to circular knitting from straight knitting? 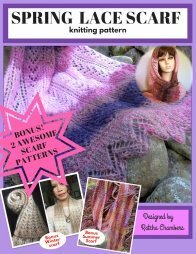 My pattern calls for the stitches, knit front and back wrap 2 and knit wrap 2. I can't find how to do these stitches anywhere. I'm ribbing front border in rib on baby Cady, pattern says cast off 5 stitches then k4 below. How do I do this? What to do with stitches? I need help to add on about 2 inches of ribbing on a completed sweater. Any suggestions? Confused with the CO instructons. How do you make an open ladder stitch? A specific sweater in referenced. What is the best way to start a new color at the beginning of a row? Should I increase every row? Does "sm" stand for "slip marker"? How to change color yarn using 3 Double point needles (DPNS)? How to k1, p1 in yo, k1 ? How do I knit intarsia on a circular needle? Is Yf (yarn forward) a form of increase knitting ? What is insert needle under next horizontal loop of row below and knit? Circular Needles - How to figure out needle size. Chair Sock Pattern - Looking for a chair sock pattern for protecting my floor. 6 X 6 rib - the first knit stitch is always really loose - help please! When knitting a 6 x 6 rib the 1st knit stitch is always really loose - has anyone any ideas how to solve this please? Please Help! Want To Know How to Knit Frock or Sweater. How do I end a piece? Where you can learn knitting for FREE! I create and manage this website by myself using Solo Build It.